Above Photo: HAYLEY MILLER/HUFFPOST. Tanya Walker, a trans woman and U.S. Army veteran, said she is “appalled” by Donald Trump’s proposed policy. “Shame! Shame! Shame!” protesters chanted. New Yorkers came out in droves Wednesday to protest President Donald Trump’s seemingly sudden decision to ban transgender people from serving in the U.S. military. 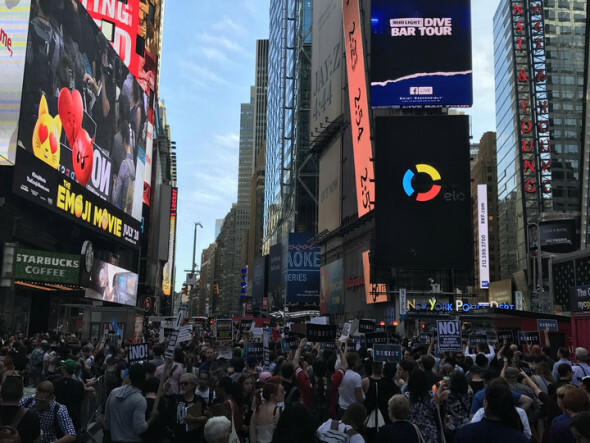 Hundreds rallied in front of the U.S. Army Career Center in Times Square as trans activists and allies blasted the president’s discriminatory policy proposal, which he announced in a series of tweets early Wednesday morning. New York City has the highest number of LGBT-identifying residents. The ban would reverse an Obama-era policy that allowed transgender people to openly serve in the country’s armed forces. The policy would affect thousands of transgender people actively serving in the U.S. military. Trump announced the ban on Wednesday on Twitter and claimed he made the move after consulting with military experts, despite the Pentagon lifting the ban on transgender service members in 2016. 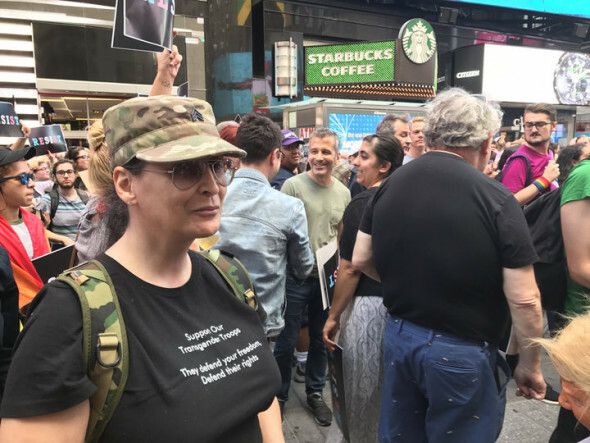 Jacqueline Swannick, a trans woman and former Army medic, joined protesters demonstrating against the proposed ban on Wednesday. Swannick, who wasn’t openly trans during her time in the military, said she wasn’t shocked by Trump’s tweets Wednesday morning given his past seemingly discriminatory policies, such as the travel ban on several predominantly Muslim countries. The rally was hosted by LGBTQ advocacy group Equality NY and sponsored by dozens of other human rights groups, as well as several local politicians. Several other cities, including San Francisco and Portland, also hosted “emergency” marches to protest the proposed ban.